For the shortbread layer: In a medium bowl, combine flour and 3/4 cup brown sugar. Using a pastry blender, cut in butter until mixture resembles coarse crumbs. Stir in 1/2 cup pecans. Press mixture evenly into bottom of a greased 9x13" baking pan. Bake for 10 minutes; remove from oven, and cool slightly, about 10 minutes. For the cheesecake layer: Place the cream cheese in the bowl of a stand mixer outfitted with a paddle attachment, and beat at medium speed until smooth. Beat in sugar. Add milk and 2 teaspoons vanilla, and beat until combined. Pour the cream cheese mixture over the cooled shortbread layer. Bake for 15 minutes; remove from oven and cool slightly, about 10 minutes. For the pecan pie layer: In a medium bowl, combine the remaining 3/4 cup brown sugar, corn syrup, and melted butter. Gently stir in the eggs, salt, and remaining 1/2 teaspoon vanilla extract. Stir in 1 1/2 cups pecans. Pour pecan mixture over cooled cheesecake layer. 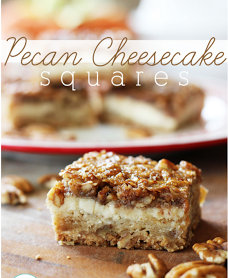 Bake for 35-40 minutes, or until center is set and pecan pie layer is a rich brown color.